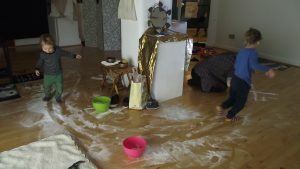 Reflections on Salt Labyrinth with children, live art performed at the Lace Market Gallery as part of the GAL collective Performing Alchemy exhibition. The exercise of creating live art with children mirrored many arcs of my personal experiences of parenthood, in the daily and in the transformation of integrating new and sometimes conflicting identities into our understanding of our self. One of the most noticeable aspects was the permeability of the salt lines. As I began drawing the labyrinth, my children were playing a racing game, running over the area where I was drawing. The labyrinth quickly started to become undone, dissolving and unfixable. Resembling my own physical and mental boundaries, internally and externally reflecting the way I have shared my body and mind with new lives. I decided to sweep away the partially complete, disintegrating labyrinth and begin another. Sweeping posed the same difficulties as the children’s games continued around me. I am used to working in this environment, with constant distraction, answering questions and simultaneously writing my own notes, playing a game whilst hand sewing, cooking and reading. It has become a skill and a way of living that enables me to synthesise all aspects of life that are personally important at any given time. The second attempt and once again the raised salt of the labyrinth corridors began to scatter, blending empty and filled spaces into a superficially indistinguishable covering of fine grains. To another’s eyes, they may only see the mess but I could see clearly where the original structure once lay and how the passing had left its indelible mark. It could never be reversed to the form it originally took and so, once again, I decided to start all over and swept the remains away. As I began sweeping, the salt became mixed with hair, dust, pieces of apple and chocolate. The performance of maintenance, of cleaning. As people walked by the space and looked on, what did they see? 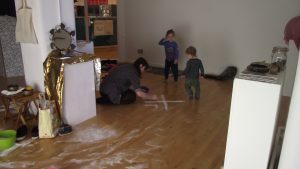 A mother sweeping with her children; a domestic labourer or an artist? How do we define and categorise these roles? What happens when we exchange one for the other? 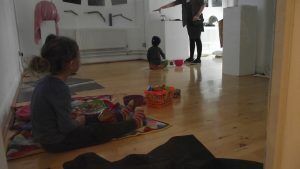 My experiences of motherhood alongside the development of a creative process were born out of necessity and are deeply intertwined in an ever-changing state in accordance with circumstances. 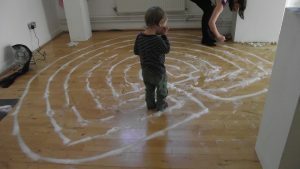 It involves prolonged periods of repetition, a concept that became visible as I attempted to make a complete labyrinth without its shape or form being disturbed by tiny feet. I began to think about the art of Mierle Laderman Ukeles and her 1968 revolutionary feminist manifesto in which she described the male avant guarde attitude toward art as “the death instinct: separation, individuality…” and her own maintenance art as “the life instinct: unification, the eternal return, the perpetuation and maintenance of the species…” (Liss). She stated, provocatively within the era, that she intended to continue carrying out culturally defined women’s daily tasks, “washing, cleaning, cooking, supporting…” and “exhibit them as art.” Perhaps an extension of the same philosophy of Marcel Duchamp who had challenged the art world with his proclamation that art could be created from the everyday (Liss). A pairing and transcendence of dualistic thought, merging subjective and the apparent ‘objective’ through scrutinising ideological constructs and division. Lost in my thoughts I was called away to provide food, resolve sibling conflict, offer reassurance, offer ideas for entertainment and all along trying to direct people around my work space rather than through it. Where did the performance end and parenting begin? Which one was being exhibited? Were they, in fact, one part of the same spectrum and not two factions that cannot be reconciled? As the task started to feel overwhelming, frustration began to creep into my body and my responses. Tension spread through my shoulders, mouth and stomach. Noticing each small trace of the children’s play and lives grounded me in unexpected ways. It shifted my thoughts from the repetition of my drawing to their individual activities, their needs, their existence. Seeing crumbs caused me to think of them as biological bodies in need of sustenance, the neurology of them learning to recognise their instincts within a complex cultural setting. It separated boundaries around expectation and action with an acute questioning of how both concepts are realised. In part, the frustration felt tied to the implicit observation of the surrounding. I had entered the gallery space with little thought as to how the work would unfold, I hadn’t even thought about it as work. 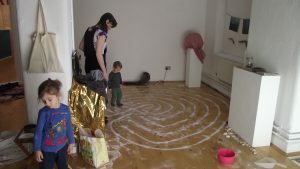 In my mind, I was going to create a labyrinth, my children would be part of that because we spend the majority of our time together sharing in each other’s interests. However, as I began drawing, I felt intensely aware of the performance of parenthood. Under the voyeuristic gaze of society, the public, participants, my children and my own internalised surveillance. Melissa Thomas lives in the UK with her 3 children. 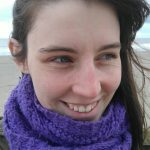 She is a writer, interdisciplinary artist and a service user advocate for maternity research. Weaving academia with a creative practice alongside her role as a mother, she combines self-directed study, art and activism with the everyday. Published in The Green Parent, Juno, AIMS Journal and The Journal of Reproductive and Infant Psychology she is currently an intern for Mom Egg Review alongside undertaking An Artists Residency in Motherhood between 2017 and 2020.